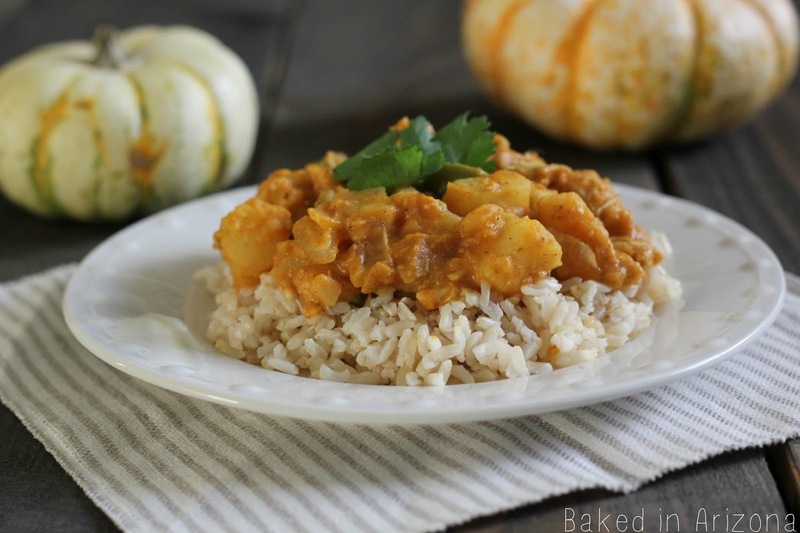 Curry with a hint of pumpkin, a delicious, easy fall meal. 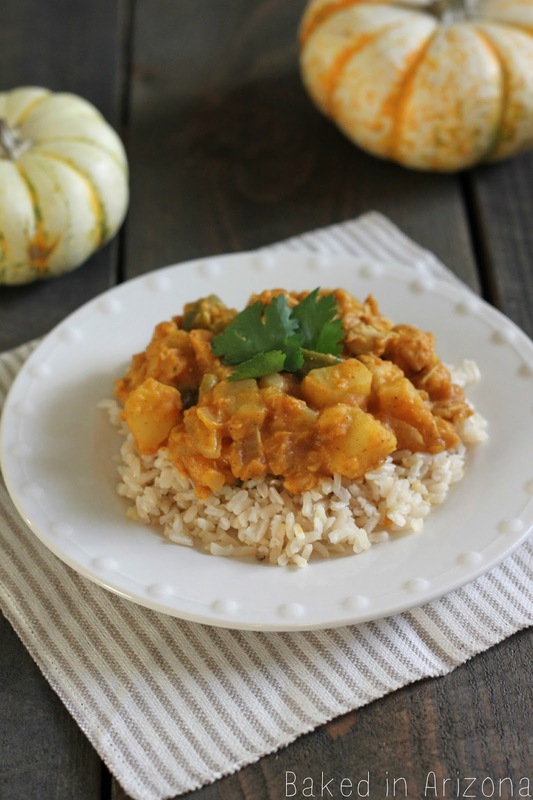 I love curry so when I saw this recipe on pinterest I couldn’t wait to try it. I changed the recipe a little by adding pineapple & potatoes. I love pineapple in my curry. I like the sweetness it adds to a spicy dish. And my husband loves potatoes so I added some as well. It made the curry nice and thick. You could always leave them out if you prefer. Or if you want to make this a vegetarian dish, you could leave out the cooked chicken and add a few more potatoes. I already had red curry powder so I used that instead of curry paste. Paste is more authentic Thai curry flavor while curry powder is more of an Indian curry flavor. I would like to try a curry paste next time and see how much of a difference I can taste. Feel free to use either one but the original recipe used curry paste. Curry is spicy but both of my kids ate this for dinner. If you don’t want it to be too spicy, I would start by adding a small amount of the curry and go from there. You can always add more. This is a fun curry. The pumpkin flavor isn’t very strong but it adds a nice richness to the dish along with some vitamins! Dice onion. Saute in a skillet with the coconut oil. When the onion is almost translucent, add the garlic and saute for one minute longer. 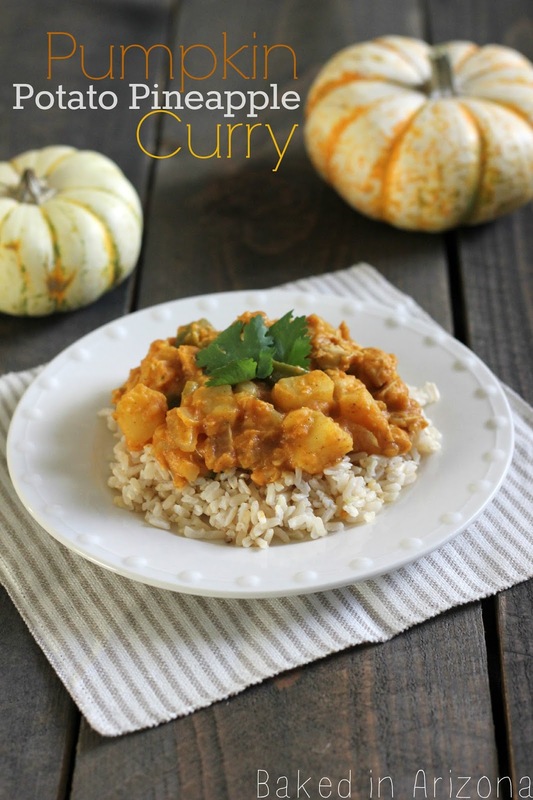 Add the pumpkin, coconut milk, pineapple tidbits, potatoes, cooked chicken, green pepper, brown sugar, soy sauce, ginger and curry powder (you can add more or less curry powder depending on how spicy you like it). Mix it together and let it simmer for 10 minutes on medium-low. Serve over rice. Notes: The original recipe used curry paste. You can use powder or paste according to your personal preference. Also, if you have fresh ginger, use 1 T. minced and add with the garlic). If you don’t have coconut oil you can omit the oil or use another kind. Thank you so much! I hope you enjoy both recipes! I will have to try the red curry paste for sure! Thanks!